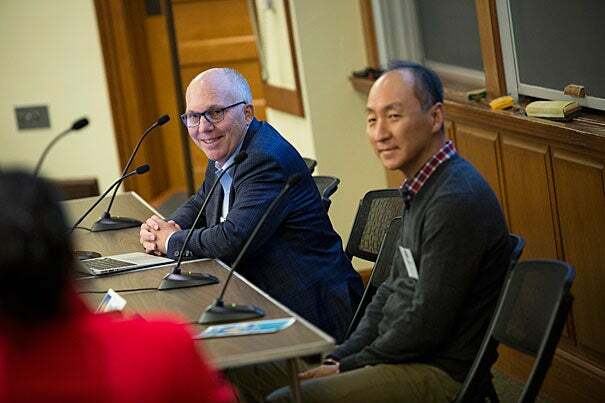 With advancing lab technology perhaps calling into question a longstanding guideline that prohibits experimentation on human embryos older than 14 days, scientists and ethicists gathered at Harvard Law School recently to discuss whether and how that stricture should be revised. Some speakers at the event, held at the School’s Austin Hall on Nov. 7, urged changes that get to heart of why 14 days was once considered appropriate rather than a simple prohibition. Lifting that limit would allow scientists to learn more about human development and improve guidance on the handling of newly developed cellular structures that mimic embryos. Other speakers, however, said it’s important to understand the political ramifications of any change, ramifications that — once the guideline was opened for discussion — could see it revised in a way that many scientists wouldn’t favor. A driving force behind the debate has been research advances that have led to the creation of self-organizing embryo-like structures (SOELS) and synthetic human embryo-like entities (SHELEs), which resemble natural human embryos in some ways. As work continues on these embryo-like structures, some scientists question whether they should be concerned about violating the 14-day rule. Further, they said, stem cell science has enabled them essentially to fast-forward through human development to create organ-like human tissues, making calendar-based guidelines less relevant. Because of that, some suggested rooting out factors behind the guideline — such as the ability to feel pain or to think — and using those to create guidelines more appropriate to the scientific work being done today. The 14-day rule is a widely accepted research guideline in the United States and is enshrined in law in a number of countries around the world. Its roots go back decades. Speakers said it was seen as appropriate because it is the point after which an embryo will not twin, and so can be considered an individual. It is also before the development of a nervous system that could allow the embryo to feel pain or think. “What are the first appearing features of the developing embryo that signify the emergence of an entity that we should protect from experimentation?” asked John Aach, lecturer on genetics at HMS. The event, “The Ethics of Early Embryo Research and the Future of the 14 Day Rule,” was sponsored by Harvard’s Edmond J. Safra Center for Ethics, the Petrie-Flom Center for Health Law Policy, Biotechnology, and Bioethics, the Harvard Stem Cell Institute, and Harvard’s Office of the Vice Provost for Research. It included a review of the guideline’s history, of recent progress in human developmental biology, and a panel discussion about the rule’s possible future. 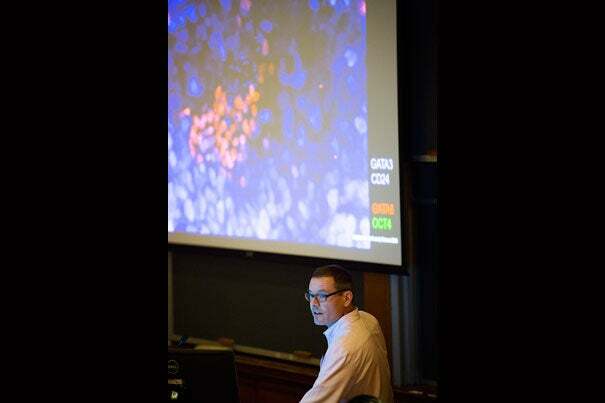 The event was also supported by the International Society for Stem Cell Research and HMS’ Center for Bioethics. While Greely advised against changing the rule as it would relate to natural human embryos, he and Roger Pedersen, a professor at the University of Cambridge, were less concerned about newly developed embryo-like structures. Since they don’t have the capacity to develop on their own, Pederson said he’d create a “bright line” between them and natural human embryos with regard to the rule. “Unless there’s a really good reason to wave the red flag in front of that bull, don’t do it,” Greely said. A new study released by Professor Matthew K. Nock indicates a sobering lack of progress on reducing suicide in the U.S. due to reliance on old approaches that consider only individual risk factors. “We need new theories and new tests of theories that take a number of factors into account at once,” said Nock.